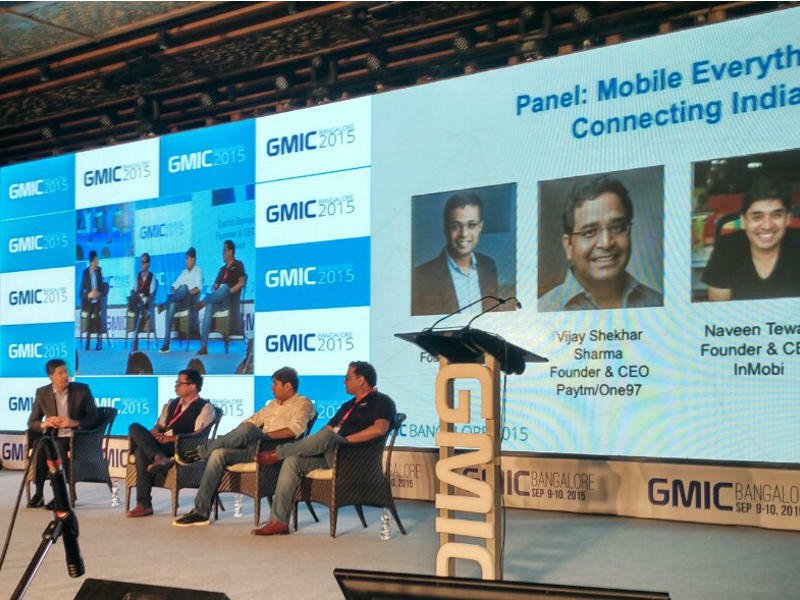 GMIC Bangalore 2015 kicked off on Thursday exploring aspects of the mobile ecosystem with the theme – ‘Mobile Everything – Connecting Innovation’. The event kicked off with a panel discussion with the CEO and founders of three Indian startup unicorns – Flipkart, InMobi, and Paytm. Vijay Shekhar Sharma, Sachin Bansal, and Naveen Tiwari spoke to a packed audience on the subject of Connecting India in a panel moderated by Vikram Chandra, CEO, NDTV. Sachin Bansal of Flipkart spoke about why it makes sense to go app only – apps will form 90 percent of Internet consumption in a few years in India. “If you win on mobile, you win everything; If you lose on mobile, you lose everything!” he said. He said that the Internet will create a market capitalisation of $1 trillion in India in ten years, and that today’s valuations were justified. Naveen Tewari, CEO of InMobi, said that augmented reality advertising was still a few years down the line, but that advertising would play a big role in it, and that they were a huge believer in it and had made investments on the same. In a panel discussion about revolutionising mobile services, Rohit Bansal, Co-Founder and COOSnapdeal, said that the most important challenge was to give away control to people who are 18-21, who first saw a mobile screen, and let them solve their problems. He cited an office warming hackathon in Gurgaon, where 700 people participated. He spoke about the mobile first ‘ungli’ generation, who have now become the chief procurement manager (CPO) of the household. The event saw panels on topics like glocalisation, the future of travel, monetising on mobile.